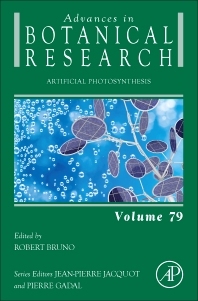 Artificial Photosynthesis, the latest edition in the Advances in Botanical Research series, which publishes in-depth and up-to-date reviews on a wide range of topics in the plant sciences features several reviews by recognized experts on all aspects of plant genetics, biochemistry, cell biology, molecular biology, physiology, and ecology. After a Master in Theoritical Physics, I joined the photosynthesis group of the Atomic Energy Commission in Saclay in December 1982 to perform a PhD in biophysics. My interests have since focused on the proteins involved in the capture of the solar photons and in the conversion of the resulting excitation energy into stable potential chemical energy during the primary steps of photosynthesis. My main activity has concerned the development of spectroscopic methods to unravel the molecular parameters which underlie the different aspects of this process. This work has conducted to the quantification of the different parameters responsible for the tuning of the absorption and stability of the light-harvesting bacteriochlorophyll molecules in antennae proteins from purple bacteria, and of the redox potential of the primary electron donor in bacterial reaction centers. In the last decade, I got involved in the study of the mechanisms of regulation of light energy collection in plants and algae. In the presence of excess illumination, energy traps quickly (in seconds) appear in their photosynthetic membranes to de-activate the excess excitation energy into heat. Since 2005, using ultrafast time-resolved absorption and vibrational spectroscopic methods, we proposed to explain this mechanism the molecular switch model, in which the pH gradient induced by photosynthetic activity triggers a conformational change of the light-harvesting protein, which open a de-excitation channel involving the silent lower energy excited state of a carotenoid molecule.